Geothermal systems are among the most advanced heating and cooling options currently available. Using the earth’s own energy, geothermal systems are able to provide your home with low cost, high efficiency heating and cooling without negatively impacting the environment. But while this technology is a great choice for most homes, it’s not something any HVAC company is qualified to work with. 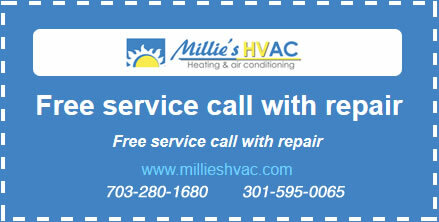 For professional geothermal service in the Arlington, Virginia area, call the highly skilled and experienced technicians at Millie’s Heating & Air Conditioning. The primary value of a geothermal system is its use of a natural energy source. Its efficiency allows it to continually provide natural heating and cooling with very minimal impact to your wallet or the environment. Although the energy source may be natural, geothermal systems are still pieces of mechanical equipment, and like any heating and cooling system there is a risk of it breaking down through regular wear and tear. That is why geothermal system maintenance is so important. Regular maintenance keeps the system running efficiently and catches minor issues early, preventing more serious breakdowns in the future. The key to geothermal maintenance is a combination of inspection and preventative service. The first step is always inspection. We come to your property and make sure that every aspect of the system is working properly. If we spot potential problems, we will notify you of the trouble areas and explain the steps we will take to fix them. The next step is cleaning. It is important that all parts that can accumulate dust, dirt, and grime be cleaned, as these can disrupt your geothermal system’s ability to circulate warm or cool air. Condenser coils should be fully cleaned as should any non-disposable filter. Pipe and duct cleaning is occasionally advised but not always necessary. We will give you a rundown on the condition of these parts and provide our professional recommendations. If you have a disposable filter, it will need to be replaced every six months to a year depending on how often your system is used and its general condition. Non-disposable filters will also need to be rotated to keep the air running through the geothermal system smoothly. If your filters get clogged, your system is going to be far less efficient, and the system may not be able to maintain the temperatures you want throughout your home. Regular geothermal system maintenance is the best way to keep serious problems from developing, as maintaining your system now will prevent your system from breaking down in the future. In addition to standard geothermal system maintenance, any additional necessary repairs found during the inspection phase will be completed. This may include part replacement or basic patch work if the parts appear to be in good working condition but show some signs of wear and tear. Your technician will let you know what areas need the most attention in order to keep them running efficiently. In rare cases, a large part of the system may be close to breaking down. When that occurs, your technician will advise you on the best solution to keep the system working. In some cases your geothermal system may need replacement, however basic repairs will often take care of the problem. Geothermal system maintenance requires a skilled hand that’s intimately familiar with the needs and inner workings of geothermal heating technology. It’s important that you hire someone that has a history of proven success working with this type of technology. That’s why if you live in the Fairfax and Loudoun County area and you need geothermal system maintenance, you should contact Millie’s HVAC. Our expert technicians have years of experience servicing geothermal heating and AC systems in the area. Call us today to learn how we can keep your system running as it should, so you can continue enjoying energy efficient and environmentally friendly home heating and cooling for years to come.